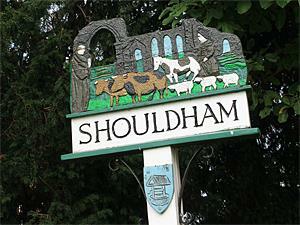 Shouldham01553 763044work VillageThe village of Shouldham lies about 7 miles north east of Downham Market. The village clusters around the attractive village green, home to the King’s Arms public house recently re-opened as a community pub. Also in the village, Chalk & Cheese also feature a gifts and local produce shop along with bar, restaurant and accommodation. The parish has a long history and was certainly well established by the time of the Norman Conquest, its population, land ownership and productive resources being extensively detailed in the Domesday Book of 1086. There is evidence of Iron Age settlement. In 1944. Digging for gravel in a field uncovered an inhumation burial with a rare anthropoid sword. Additionally, crop marks visible on aerial photographs taken over fields to the northeast of Shouldham village show two potential Iron Age roundhouses. All Saints' Church lies on the outskirts of the village in an elevated position looking over the village itself in a beautiful setting. Built from a mixture of Carrstone and flint, the tower appears to be one of the earliest features, dating to the late 13th/early 14th century. The splendid nave roof has alternating large and small hammer beams and features hammer posts bearing carved angels. The village of Shouldham lies about 7 miles north east of Downham Market. The village clusters around the attractive village green, home to the King’s Arms public house recently re-opened as a community pub. Also in the village, Chalk & Cheese also feature a gifts and local produce shop along with bar, restaurant and accommodation. Situated within the Nar Valley, Shouldham is in the lee of a chalk ridge that rises above the Fens to the west. Just outside the village is Shouldham Warren which features two woodland walks, a Rhododendron avenue. Shouldham Warren is now managed under the same access rights as the Thetford Forest, with opportunities for walking, cycling and horse riding.